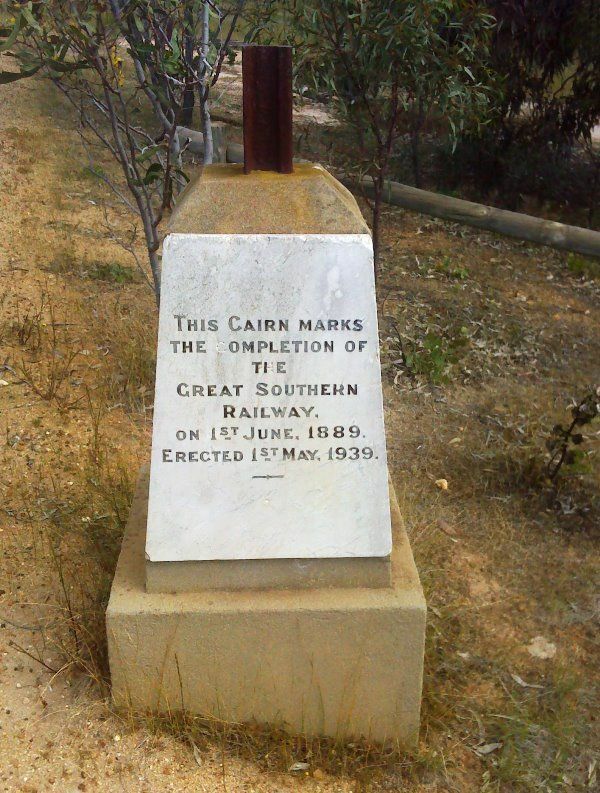 A cairn marks the completion of the Great Southern Railway in June 1889. In 1886 the government concluded a land-grant railway agreement with an English syndicate, the Western Australian Land Co., which agreed to construct, equip and run a railway between Beverley and Albany in return for extensive land-grants. The line was surveyed twenty-five miles (40 km) east of Williams and signified a decline in traffic along the Albany Road. The Great Southern Line opened in 1889 and the town of Katanning mushroomed round the central station`s shunting yards and goods shed. Just 50 years ago a little band of railway construction engineers, representatives of the West Australian Land Company and fettlers drove a silver spike into a sleeper at a point on the Great Southern railway exactly halfway between Beverley and Albany. The ceremony marked at the same time the completion of the railway between Perth and Albany and the beginning of the town of Katanning. Yesterday another ceremony took place, when a memorial erected to mark the spot for all time was unveiled. It was one of the chief functions of the Katanning jubilee celebrations, which began on Saturday and will continue until Thursday. Leaving Katanning in a fleet of cars, a large party went first to the Police Pools, about three miles south of Katanning for the unveiling of the police memorial. After the unveiling, the party then left for a point on the railway about five miles north of Katanning, where the two ends of the line were joined on June 1, 1889. The spot was marked by an obelisk in the top of which was a piece of the original rail laid in the line. The West Australian (Perth), 2nd May 1939. This cairn marks the completion of the Great Southern Railway, on 1st June, 1889.